Conversant Video, Mobile, Rich Media, Banner, Email advertising network details. With 20 years of experience in the digital marketing industry, Conversant has worked with 4,300 clients including more than 400 blue chip brands and 65 of the Top 100 Internet retailers. The network generates 5.1 million purchases per day and an average 10x ROI. 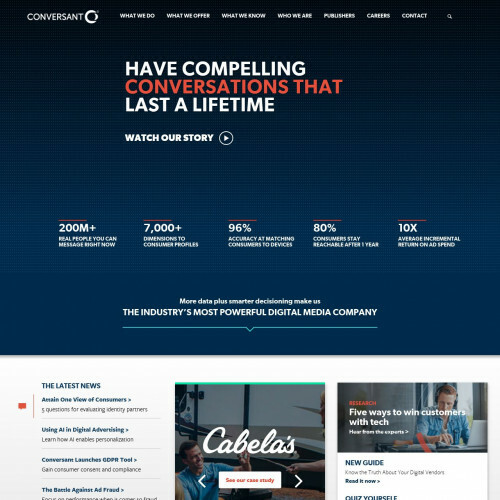 Using Conversant's services, you will have 178+ chances to connect with right consumers every day, across 173,000 apps and over 1 million websites. Conversant guarantees that your ads will reach real customers (not bots) at the right moment with action messages that are viewable in brand-safe environments. By that way, Conversant helps you expand your customer base and drive actions to boost your sales. You can check Conversant reviews on Affbank and ask Conversant Team any question by using the contacts above, especially about how to earn money!